In keeping with the basic tenants that have defined the Olympics time immemorial, namely international cooperation, unification and cultural exchange, Sports for Peace—an initiative to provide athletes with a platform to promote those very tenants—hosted a gala to honor Muhammad Ali and his non-profit, The Muhammad Ali Parkinson Center. The charity event, which was thrown at the Victoria & Albert Museum on July 25th, included a black tie gala dinner and an auction hosted by Christies, which featured the use of personal ipads at each guests’ place setting. Ticket prices for the event ran upward of £2000 and among the guests were celebrities, athletes and politicians alike, including Rosaria Dawson, Lewis Hamilton and Lauren Bush. On July 31st, in the heart of London’s trendy SoHo district, Omega’s brand ambassador Nicole Kidman helped launch the watch company’s newest ad campaign. Apropos to the commencement of the Olympics—as Omega was the official timekeeper of the London 2012 Games after all—the private party took place at The House of St. Barnabas, a historic building nestled deep into the winding streets of one of London’s most complex neighborhoods. “The trek to get there amid Olympics madness proved to be quite an ordeal”, said Lady Victoria. The effort was definitely worth it though. The house had been remodeled specifically for the launch. Hervey described how each room was designed to “reflect an Omega collection or timepiece”. The new space then served as a club for the watch company’s private events during the Olympics. One of its more eye catching features was a white sculpture of a diver, designed for Omega by Wootton and Dawe, suspended like a mobile above the house’s long, winding staircase, as a nod to the company’s long-established diving watch lines. The party was attended by about 400 guests, including Kidman and her husband Keith Urban, Kit Harrington and Eddie Redmayne to name a few. Jarvis Cocker, from the Brit Rock band Pulp spun the tunes for the evening. On opening night, England’s timeless Brit Pop darlings, Duran Duran, headlined a mammoth live show in Hyde Park, attended by nearly 50,000 people. So singular it was in its importance that it warranted an extension by London’s officials of the city’s typically strict (and early) noise curfew, commented Lady Victoria. Each band in the lineup represented a different country of origin in the United Kingdom, including Paolo Nutini from Scotland, Welsh natives Stereophonics and Ireland’s Snow Patrol. 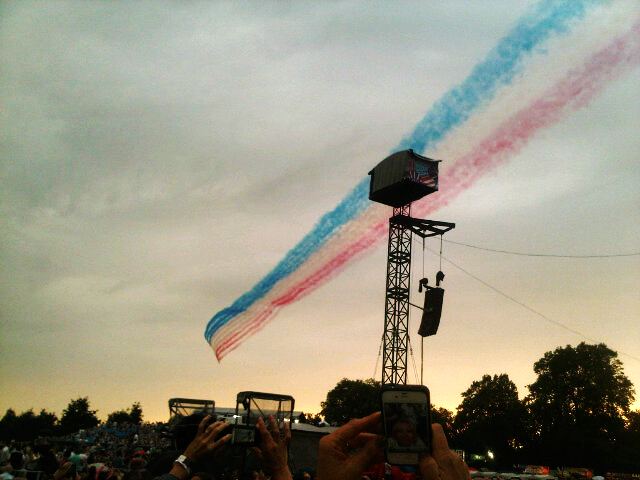 From backstage, Victoria danced to Duran Duran’s performance of “Reflex” during which Red Arrows flew above the crowd, and Snow Patrol’s hit “Chasing Cars” coinciding with massive live video projections on screens overlooking the park, of Olympic athletes attending the opening ceremony. The invite-only after party at Cuckoo was “quite the spectacle” and was sponsored by Belvedere, Peroni and Moet Hennessey. Flo Rida. In solidarity with all things British, the party guests were served classic treats such as Yorkshire pudding and roast beef canapés. Fashion made its statement at the Olympics on July 25th, with Karl Lagerfeld’s launch of his new pop-up capsule collection for the biennial event, entitled “Team Karl”, featuring sporty outerwear, skinny jeans, and of course the requisite Olympic medal-themed jewelry line. “The entire fashion crowd came out for this!”, said Lady V. The guests, who included Daphne Guinness, Jefferson Hack, Talullah Harlech and Edie Campbell were treated to rooftop cocktails at the store, and partied to DJ sets by Harley Viera Newton and Alison Mosshart. Selfridges’ designated ‘Karl store’, which will occupy the third floor of the building, was also launched for the event, to which guests were given exclusive shopping access.